Three games. Three days. Three wins. Not a bad weekend for the Devils, who went from being just outside the playoff picture to being in the middle of it. But after Sunday’s events, it could be a very interesting week in the organization as New Jersey gets back to work after the Olympic Break. 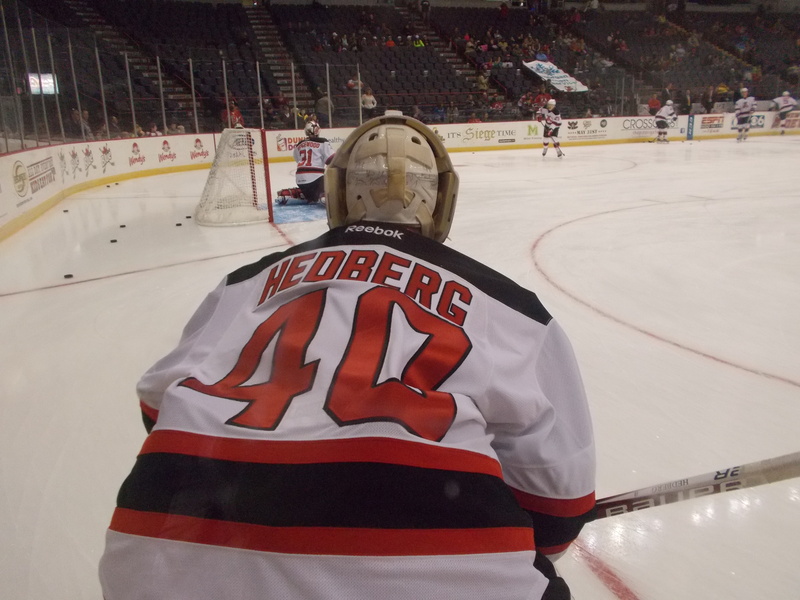 Tuesday: With Keith Kinkaid returning to practice, Johan Hedberg was released from his PTO after filling in for the weekend and even getting in some game action on Sunday. Wednesday: Jon Merrill was recalled to New Jersey after not even making one appearance during his 9 day stay on the roster. 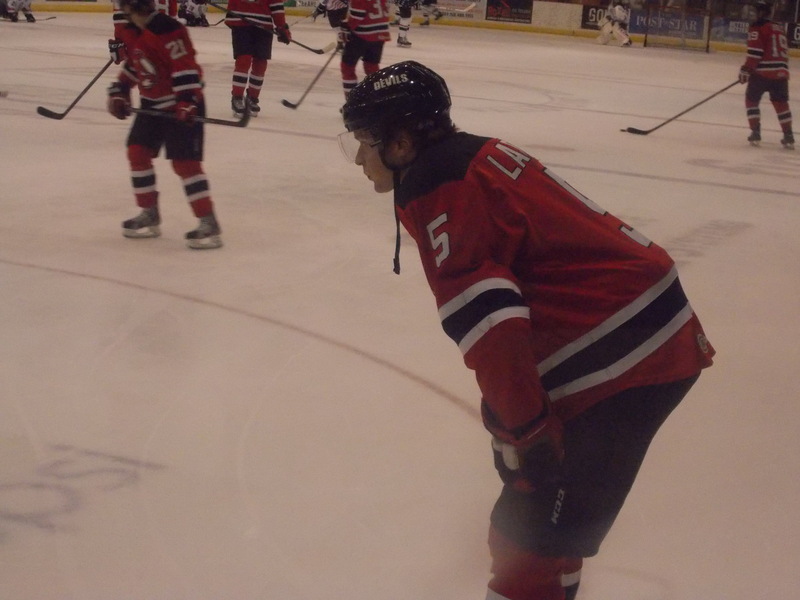 In fact, I don’t even recall seeing any uniform number assigned to him while he was here (his #5 was taken over by Adam Larsson and Reece Scarlett wears his New Jersey #34). It was back north to Glens Falls for a rematch from last weekend with the Phantoms, who were quite shorthanded after their end of game brawl against Portland on Sunday. And the visitors came in and took advantage. 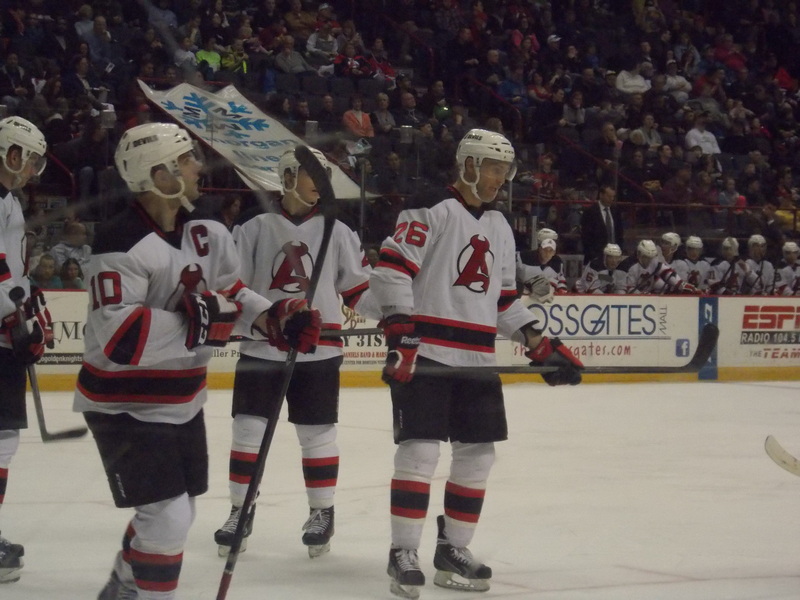 Despite only 3 shots in the first period, it was Albany with the 1-0 lead on a Stefan Matteau goal. Kyle Flanagan would tie the game at 1 just 30 seconds into the second period on a fluke bounce that Keith Kinkaid never saw coming. But the Devils would take control after that, via the special teams route. While in the midst of killing off a Matteau double minor, Mike Sislo broke away and scored a beautiful shorthanded goal for a 2-1 lead. Rod Pelley would also score shorthanded late in the period for a 3-1 lead. Sislo would score his second early in the third for a 4-1 advantage. 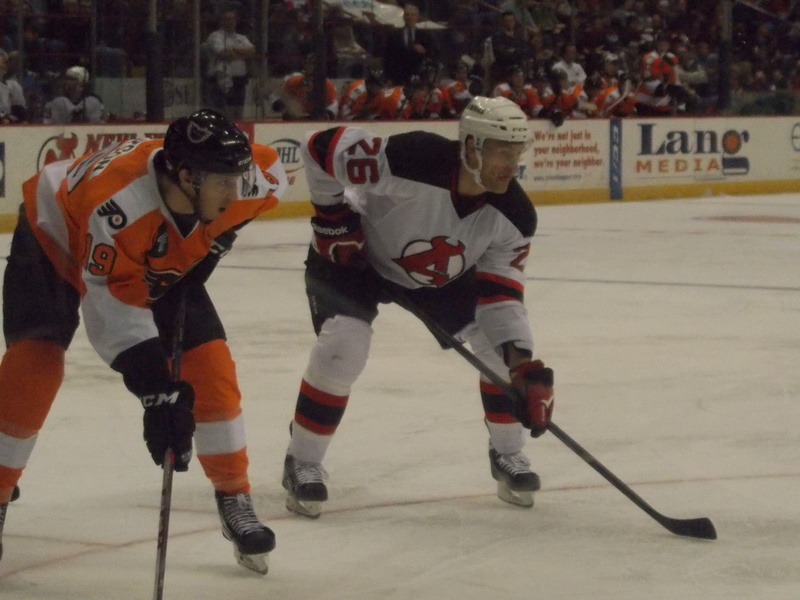 The Phantoms would get to within 4-2, but Kinkaid and the Devils would shut it down from there, getting two very important points that put them back in the playoff hunt. 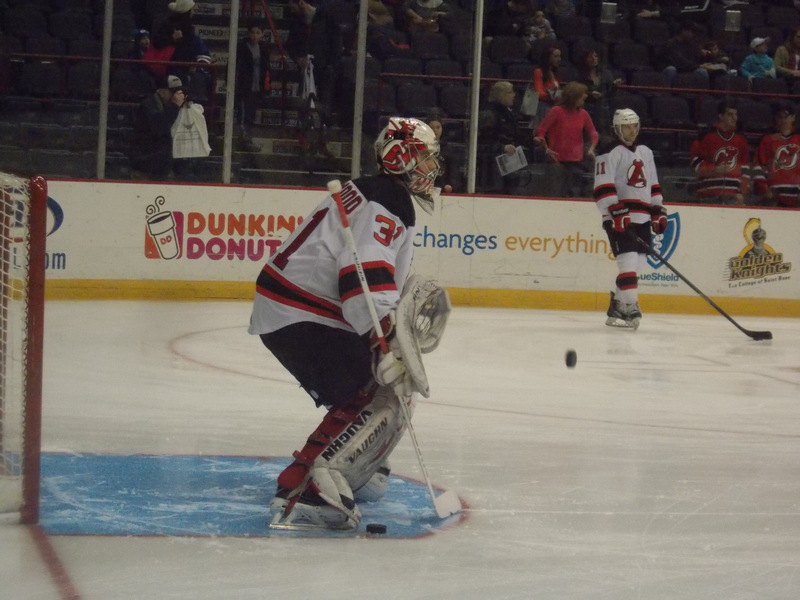 Kinkaid played stellar in his return to the lineup, stopping 30 of 32 shots. Adam Larsson added two assists and finished a +2. It was back on home ice Saturday afternoon as the Devils played host to the Admirals in a crucial game for both teams; they were tied for 8th place in the Eastern Conference with a chance to move up the list on the line. Much like the night before, Stefan Matteau kicked off the scoring on the Devils’ first shot of the game, going up 1-0 4 and a half minutes in. Norm Ezekiel would tie the game at 1 late in the period. Second period Albany took over, scoring twice and outshooting the Admirals 15-6. Mike Sislo would score his third goal in two days on a power play to break the tie, then Reid Boucher added his 13th less than 4 minutes later for a 2 goal cushion. Norfolk tried to make a comeback in the third, but Keith Kinkaid was up to the challenge, stopping all 9 3rd period shots. 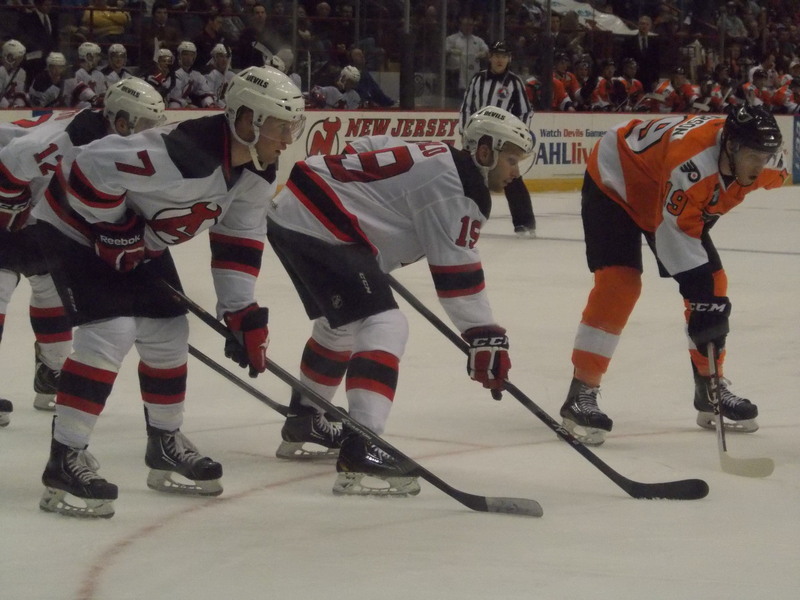 Kelly Zajac added an empty netter late to seal the Devils second straight win. Kinkaid finished with 25 saves on 26 shots in another stellar performance. Four Devils added assists. 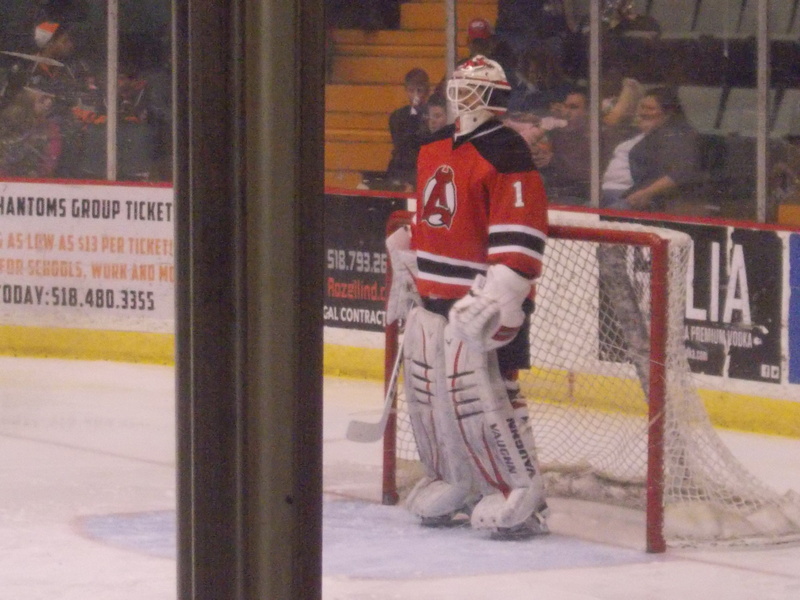 Sunday: Just as the first period was getting underway, Elmira announced that goaltender Maxime Clermont, just off the injured list, had been recalled to Albany. Here’s the fun part: Nobody knew the transaction took place, not even the coaching staff. 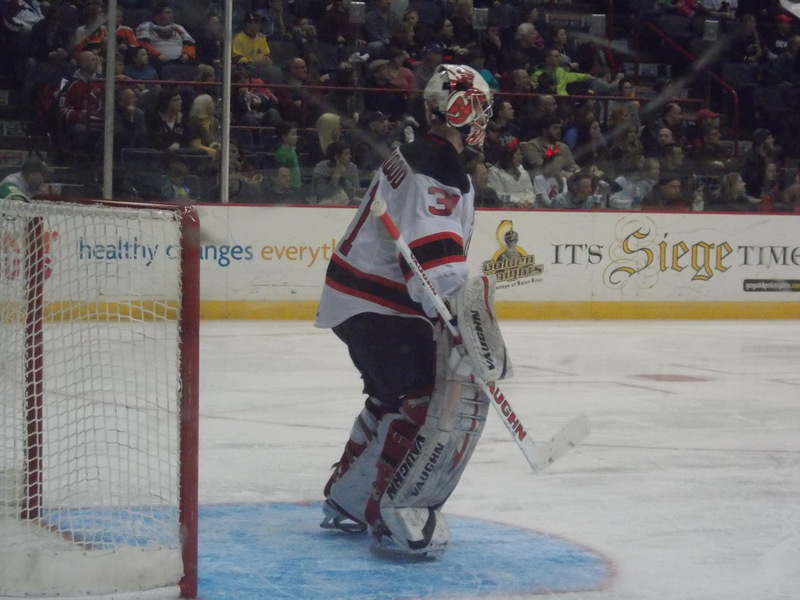 Keith Kinkaid and Scott Wedgewood are both fine, so the only other possibility is something is going on in New Jersey. Stay tuned as this unfolds. 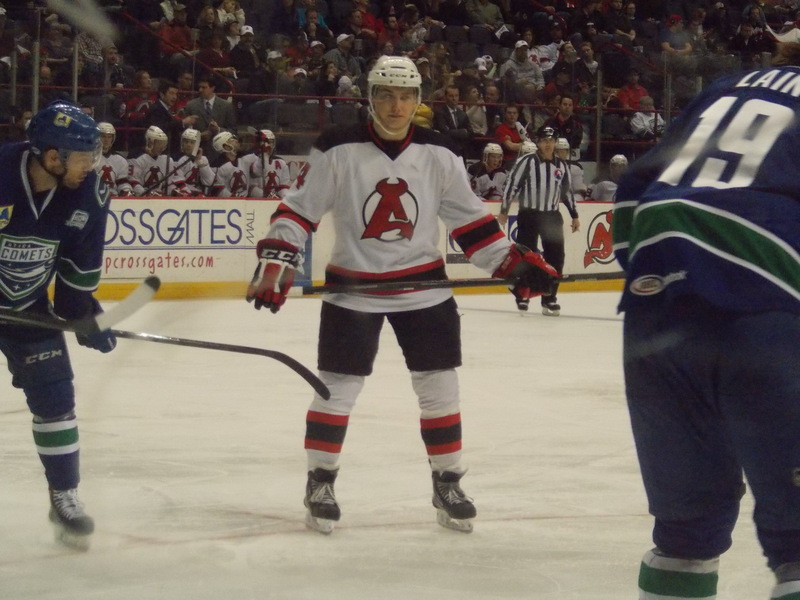 To close out the weekend and the month of February, the Devils played host to the Comets, who were on a streak of their own after wins in Syracuse and Binghamton. After a scoreless first period, Albany would get on the board in the second. 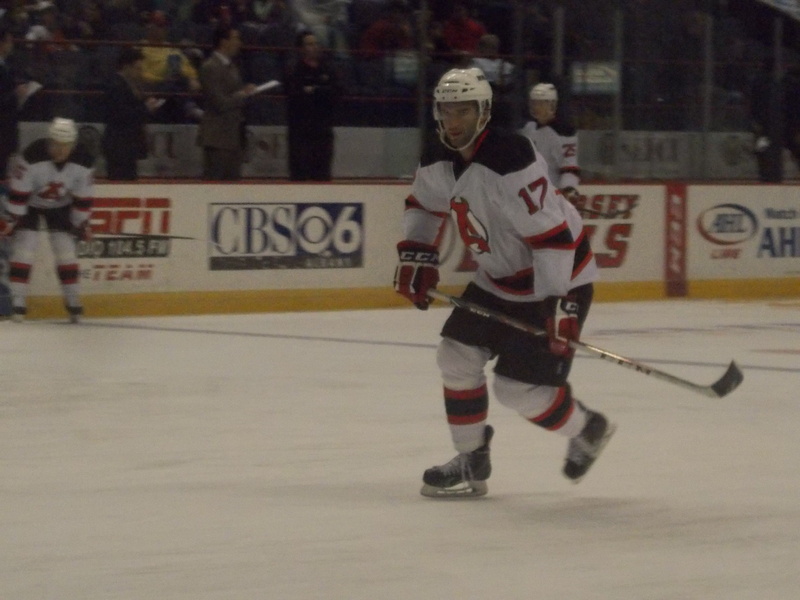 Mike Sislo tipped in a Reece Scarlett shot from the blue line for his 4th goal of the weekend to put the Devils up 1-0. Reid Boucher would add a power play goal less than 2 minutes later for a 2-0 advantage. Jeremy Welsh would cut the deficit in half for the Comets with 5 minutes to go in the second period. Things would get interesting in the third when Tim Sestito was called for a late penalty with less than a minute to go in regulation. But the Devils managed to kill off the 6 on 4 chance (empty net as well) to hold on for the win, their first on a Sunday all season and a clean sweep of the weekend. Scott Wedgewood drew the start and didn’t have to do a whole lot, stopping 15 of 16 shots. Scarlett and Scott Timmins each had an assist. A pretty easy choice this week…have to give it to Mike Sislo. Goals in all 3 games (2 in Friday’s win), increasing his season total to a career high 17. Honorable mention goes to the penalty kill, going a perfect 16 for 16 and even scoring shorthanded twice. The Jackals had a 3 in 3 weekend of their own, all on home ice and all against Wheeling. They took the first game on Friday evening before dropping both Saturday and Sunday’s games to the Nailers, putting their record at 20-25-2-4. Harry Young was rather busy on Saturday and Sunday, racking up 12 penalty minutes. Maxime Clermont backed up on Friday and Saturday but did not see any action. Riley Boychuk sat out all three games. 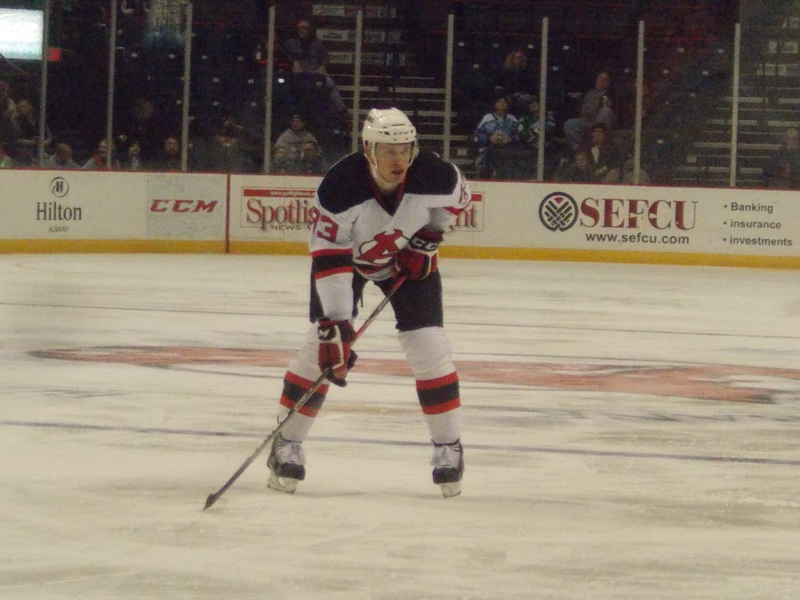 Alexander Urbom returned to the lineup Friday after sitting out last weekend due to illness. 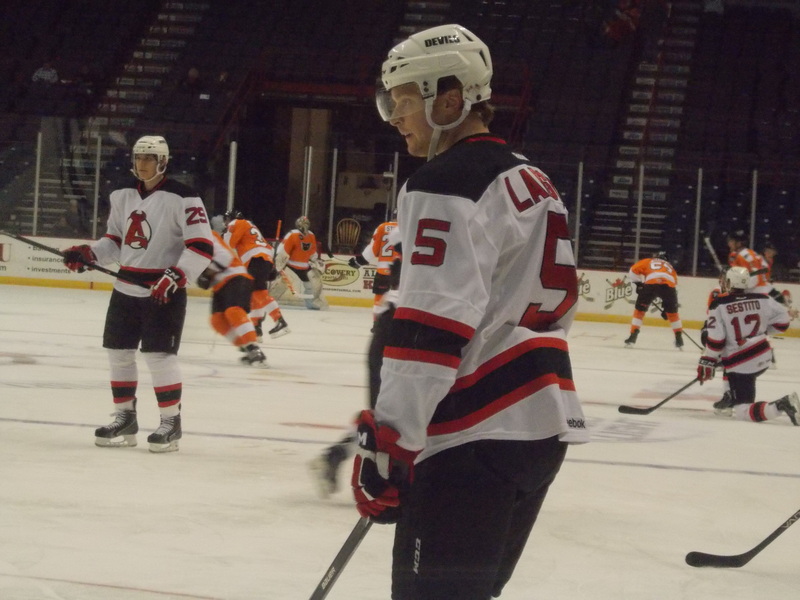 That just leaves three forwards out: Chris McKelvie (lower body), Darcy Zajac and Cam Janssen. Janssen seems to be the closest of the three to returning. A quick two game weekend to begin the month of March. 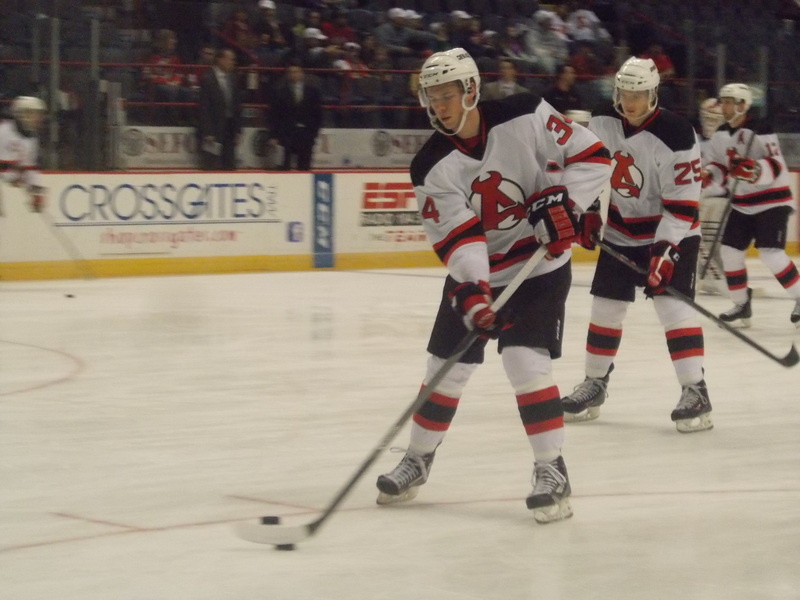 Saturday afternoon the Devils travel to Atlantic City to “host” Wilkes-Barre. Then it’s off to Providence on Sunday afternoon for their first matchup of the season against the Bruins. Also on Sunday: I’ll be coming back to New Jersey for the San Jose game! And starting with Saturday’s pregamer: the return of Conference Standings. Yup, it’s getting to be that time of year already!